Hispanic, Afro-Caribbean and North American influences meld in Puerto Rico, a self-governing commonwealth that belongs to the United States. The subtropical Caribbean territory is urbanised, industrialised and relatively prosperous. The US invaded and occupied Puerto Rico during the Spanish-American War of 1898, ending centuries of rule from Spain. The US saw the island as a strategic asset and ran it as a colonial protectorate. Under American administration Puerto Rico saw growth and development. But nationalist sentiment sometimes spilled over into violence, notably in the 1930s and 1940s. Nationalists staged an armed attack in the US Congress in 1954. A series of bombings and killings in the 1970s and 1980s were blamed on a pro-independence group, the Macheteros, or Cane Cutters. The group's fugitive leader was killed by federal agents in 2005. Puerto Ricans are to vote on their island's political status in a referendum scheduled for August 2012. They will be asked whether they want a change in status or prefer to remain in a US commonwealth. In a second part of the referendum they will be asked to choose from three options: statehood, independence or sovereign free association. Regardless of what they decide, any change requires approval by the US Congress and president. Puerto Rican voters, who elect a governor for the island, have tended to favour parties that support the union with the US. Puerto Ricans do not pay US income tax, and the island receives federal funds. There is an established cycle of migration between Puerto Rico and the US; hundreds of thousands of Puerto Ricans have lived and worked in New York and other cities. The once substantial US military presence has been scaled down with the closures of a major naval base and a bombing range. Rancour over the latter grew after a civilian employee was killed by a stray bomb. Explorer Christopher Columbus claimed Puerto Rico for Spain in 1493, heralding an influx of Spanish settlers. The newcomers, and the diseases they brought with them, decimated the territory's Taino indian population. 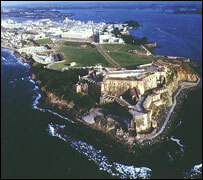 The main settlement, San Juan, became an important Spanish outpost. Slaves were brought to the island in the 16th and 17th centuries. Puerto Rico's landscape is varied, and includes rainforests in the north-east. The territory is prone to hurricanes. Tourism is an important money-earner; the island receives up to two million visitors each year and is a port-of-call for cruise liners. 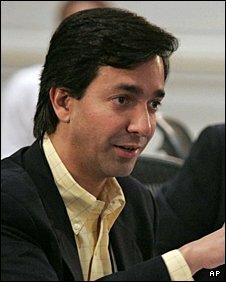 Luis Fortuno of the New Progressive Party began his term in January 2009, and is the ninth governor of Puerto Rico. His party, which favours full integration of Puerto Rico as the 51st US state, also won the November 2008 elections to Puerto Rico's legislative assembly. He succeeded Anibal Acevedo Vila of the Popular Democratic Party, who served from 2004-2008. Mr Acevedo Vila had initially favoured maintaining Puerto Rico's commonwealth status, but later called on the USA to let it decide its own future. Puerto Ricans elect their governor for a four-year term. The constitution, modelled on that of the US, provides for a Senate and House of Representatives. However, voters in a referendum in 2005 backed the idea of replacing the bodies with a one-house legislature. Residents of Puerto Rico cannot vote in US presidential elections. But they do elect a non-voting delegate to the US Congress. Since taking office, Mr Fortuno has launched a major programme of public spending cuts. In May 2009 tens of thousands of workers marched through the streets of San Juan in protest at possible major layoffs. Home-grown comedies, talk shows and Spanish-language soaps are staple fare on local TV stations. The multichannel offerings of cable TV are widely available. News and talk and Spanish-language pop music are among the most popular radio formats.